Albany City Hall, Albany is the oldest municipality in the Capital District. There are three types of incorporated municipalities in the Capital District of the U.S. state of New York: city, town, and village. In the state of New York all the land in a county is in a city, town, or Indian Reservation; while villages are within towns and may cross town or county lines. There are 11 counties in the Capital District comprising 13 cities, 143 towns, and 62 villages. The counties are Albany, Columbia, Greene, Fulton, Montgomery, Rensselaer, Saratoga, Schenectady, Schoharie, Warren, and Washington. The village of Green Island is coterminous with the town of the same name. Ballston Spa, Broadalbin, Cambridge, Chatham, Fort Plain, Greenwich, Nassau, and Valley Falls are villages that cross into two towns. The village of Dolgeville is partly in Fulton County, but is mostly in Herkimer County, which is part of the Utica-Rome Metropolitan Statistical Area. 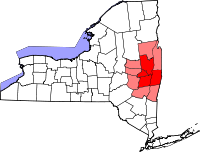 Ten of the eleven counties of the Capital District make up two Metropolitan Statistical Areas (MSA) and three Micropolitan Statistical Areas (µSA), which those five statistical areas then make up the Albany-Schenectady-Amsterdam Combined Statistical Area. Albany, Rensselaer, Saratoga, Schenectady, and Schoharie counties make up the Albany-Schenectady-Troy MSA; while Warren and Washington counties are the constituent counties of the Glens Falls MSA. Fulton County is the sole county in the Gloversville µSA, Montgomery County is the Amsterdam µSA, and Columbia County is the Hudson µSA. Greene County is not in any CSA, MSA, or µSA. ^ "Governmental Units". John B. Deitz. Retrieved May 18, 2009. ^ "Legal Memorandum LG06". New York State Office of General Counsel. Archived from the original on June 6, 2011. Retrieved May 18, 2009. ^ "Metropolitan Statistical Areas in New York State" (PDF). New York Department of Labor. Retrieved 2010-08-28. This page was last edited on 21 May 2017, at 21:32 (UTC).